I'm not alone in my belief that avant-garde (free) Jazz left just about everyone behind in the 1960s, just when Rock was firmly establishing itself worldwide. But most Jazz musicians of that time I believe recognized that they were leaving their audiences behind. "Jazz Fusion" was born--a fusion of Jazz and Rock. Miles Davis tried it but I believe he notably failed as per the conversions of Donald Fagen of Steely Dan mentioned (and re-quoted here). I think Jazz has been with us and has continually influenced our music profoundly. We just haven't been calling it "Jazz". I know that I still play my old Steely Dan, Chicago, BS&T, and Mahavishnu Orchestra, Billy Cobham, Return to Forever, much more than other old albums. Newer recordings by The Yellowjackets, Pat Metheny Group, Norah Jones, Esperanza Spalding, Stacy Kent, Diana Krall, Hiromi, Jean-Luc Ponty, and many others--are played in my household disproportionately more often than Blues and its offspring Rock (probably by a factor of 2x-3x). My music library consists of 25% Jazz, just behind Classical (33%), and then Rock (20%). I live in an area where Jazz has had a disproportionate effect on music students in college...the University of North Texas--a.k.a., the "One O'Clock Lab Band" and the other 10-20 lab bands there, and even other Universities in the area including UT Arlington, TCU, and a few others--notably community colleges. Many of my musician friends from high school (as well as my children's musician friends from high school) went on to these institutions for their professional music education. If you didn't know, the musicianship level of these institutions is what I'd call "ferocious"--as I believe that many think of the NTU Lab Band scene as a sort of "meat grinder" for good musicians that get pulled in and ground up. I can see the effect of academia on the ideas of "Jazz" that still exist out of the mainstream of music today, i.e., very few people come home and put on the One O'Clock's recordings to relax to. KNTU 88.1 broadcasts that sort of Jazz on the FM dial locally for those that can't seem to get enough. I found that I get sort of filled up fairly quickly by that style of Jazz. I rather listen to a little less "intense" Jazz of today, and it's usually called "Fusion". Sometimes you'll also see me put on a little "Light Jazz" from time to time. I believe that mainstream Jazz isn't really found in colleges nowadays. Perhaps Berklee graduates in the Northeast are a bit more in tune with the current state of Jazz. It's all post Bop in this area--which has become insulated and less relevant than the other sorts of Jazz from the late 1960s that I listed above. To me, Fusion and other associated genres are the testimonial of where real "modern Jazz" has gone. I live in an area where Jazz has had a disproportionate effect on music students in college...the University of North Texas--a.k.a., the "One O'Clock Lab Band" and the other 10-20 lab bands there, and even other Universities in the area including UT Arlington, TCU, and a few others--notably community colleges. North Texas has a national reputation for their great music school. Texas in general has a reputation for having incredible marching bands with the greatest talent pool in the country. Football is king in Texas but their marching bands are right there with them. I'll go on record (get it? ) as being a jazz fan, but not a fan of all jazz. I like the big bands which are brass oriented. Think Stan Kenton, Maynard Ferguson and my favorite genre, drum and bugle corps which often plays jazz' greatest hits. The greatest jazz players in DCI history are the Blue Devils from Concord, California. What I like is the big brass, loud, and screamers in the trumpet section. The kind of jazz I don't like is the free from style where musicians improvise for ten minutes all while trying to prove has fast they can play 16th notes. This is what I would call the finger races, clarinet and sax runs as fast as they can be played. Not my favorite. Is jazz dying? I don't know, it's really never been popular. It strikes a chord (get it?😎) mostly with musicians, not the population in general. Here's a snippet of what I like about drum corps and jazz, this from a Burt Bacharach show. This Youtube vid is only a fraction of how good the Blu-ray disk sounds. This is why I have Klipsch speakers, it takes horns to play horns. ...it's really never been popular. It strikes a chord (get it?😎) mostly with musicians, not the population in general. If you think only of your lifetime, perhaps that's true (depending on the year of birth and what you call Jazz--like Be-Bop and Cool Jazz), but for folks born from 1915-1945, Jazz (especially Swing Jazz) easily became #1 and stayed there until the mid-1950s. But I think that the advent of inexpensive phonograph players and records (and home hi-fi, which began at that time) put pressure on big bands economically (who played in big bars and hotel ballrooms), such that small Jazz groups had to substitute. There were three notable people that formed what we now call "Academic Jazz" in NYC by the late 1940s (i.e., Be-Bop fully improvisational Jazz): Dizzy Gillespie, Charlie Parker, and Thelonius Monk. The three cats you just mentioned rule! The Diz, Bird, and Monk are still inspirational. Bebop is my favorite form of the genre. If some think they killed jazz, then it is only because they represent the pinnacle of the art form. Between them and the also mentioned Cobham and RTF, I grew up (for the most part in North Central Texas--went to both TCU and UNT) constantly listening to and emulating those guys musically. Personally, the popular big bands our parents and grandparents listened to were mostly dance music in the realm of "popular music" of their day, with some notable exceptions like Count Basie, and perhaps Woody Herman. The rest hardly count as "jazz." I suppose that's why they are often put in the category of "swing." Later, Maynard Ferguson did his best to combine the best of combos and the big band sound, and hired a lot of North Texas educated monsters probably on the cheap because they were young and were honored to perform with the man. By the way, Bebop is not fully improvisational, it has a form which includes places for improv. Another point of order: KNTU plays a wide variety of styles, so it probably depends on the time of day and the DJ for what is broadcast. It is a major preset on the car radio for me. ...so it's difficult to for me to imagine Swing isn't an integral part of the enchilada. I'd forgotten about the weekends, etc. for KNTU, since I don't drive to and from work anymore and therefore don't really listen to it like I did 5+ years ago. (I remember some of the selections on the weekends could get "pretty esoteric" 😬 ) I picked up a lot of Jazz CDs listening to that station over the years. I would take Miles over Wynton, but maybe because like I said how I was raised. I have lp's from my mom's collection which include a couple of the Miles Columbia recordings. Bebop I think (imho) was a reaction culturally to a restrictive and perhaps hijacking of the heritage of the music, and they were taking it back. I'll take anyone to the mat over the strictures of improvisation, because if you notice, most of the improv starts with, then departs from, and then usually does come back to the theme---and that is the brilliance of it. Fusion is definitely included, despite what Kenton had to say. I lost all respect for the man after his comment about Corea not being jazz. This was at a clinic I attended so I am speaking as a first person source. I turn the channel if Kenton comes on. Of course you realize the connection between Corea and Miles...thinking it over maybe I am not the best responder to the thread because I probably represent what you call academia in this case. Academia did not kill jazz, it just evolved like its audience. The 1930s and 40s was the era when jazz was all pervasive and the pop music of the day. However the kids grew up and stopped dancing to jazz. Their kids wanted something new (rock). The jazz players innovated seeking more artistic freedom and a new audience. The audience gradually dwindled. Over the last 20 plus years, if you wanted to make a living in the jazz world you could only really do it at a college/university/conservatory. At that point the audience is not so important so you can do what you want. Thus jazz gets even more experimental. Other than a very small few, there are no jazz only players making a living. These days you need to be able to do it all (and extremely well) to eat. All those kids playing in college jazz bands better branch out, it doesn't matter how good you are if there is no work. Kind of the same with those studying orchestral music. To the point however, all music evolves. Academia is where jazz thrives, freed from having to be popular music it can be more expressive, complex, and experimental. All good points. I've noticed that musicians in some genres defend the honor of their favorite genres "to the death", while others are a lot more inclusive and accepting of different interpretations of what each genre "is". I've noticed that musicians in some genres defend the honor of their favorite genres "to the death", while others are a lot more inclusive and accepting of different interpretations of what each genre "is". If you think only of your lifetime, perhaps that's true (depending on the year of birth and what you call Jazz--like Be-Bop and Cool Jazz), but for folks born from 1915-1945, Jazz (especially Swing Jazz) easily became #1 and stayed there until the mid-1950s. And I'll agree with you on all your points. I'm a person a bit out of time. 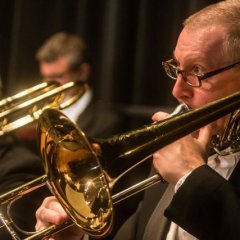 I grew up musically on the Beach Boys and Beatles but my dad played trombone in a 17 piece big band so I was very much tuned into the 40's and WWII era of music. Glen Miller was my favorite musician growing up. I still haven't gotten over his plane going down in the English channel in 1944. Jeff Beck embodies the fusion of jazz and rock from that era. Good stuff. I think if you like that you would like similar groups like Chicago, Yes (think Roundabout) and maybe some Chick Corea. The whole album My Spanish Heart is good. Of course, I like Chicago and Yes a lot. Don't know about Chick Correa. I like BS&T a lot. EL&P, too. I'm with you on all of those. I saw both BS&t and ELP in concert, both good, ELP fantastic. Check my earlier post, I put a snippet of Chick Corea in there. He is the keyboard player and is known for complex musical rhythms. He makes interesting music. Try "Spanish Key" from ******* Brew, then come back and talk about it.